This package includes 8 concerts at the Embassy Theatre and 2 concerts at the PFW Rhinehart Music Center. If you are a new subscriber we will seat you in best available seating based on your indicated seating level and preferences indicated in the space provided below. From lush, romantic piano harmonies to flurries of scales and powerful brass passages, this opening night concert is a feast for the senses. Sixteen violins that survived the Holocaust. Three composers banned by the Nazis. Violins of Hope tells stories of defiance, resilience, and legacy, a testament to the power of music. Enjoy enduringly popular melodies like In the Hall of the Mountain King and Borodin’s famous theme, incorporated into the 1953 Broadway musical Kismet as Stranger in Paradise. A brilliant musical master, about whom the Los Angeles Times says, “Zukerman again seemed the forever-young virtuoso…expressively resourceful…technically impeccable, effortless…"
With its large, percussion-driven orchestra and mixed chorus that sings racy texts by wayward monks, Carmina Burana celebrates the joys of the tavern, nature, humor, and love. Nine symphonies, five piano concertos, but only one Violin Concerto? 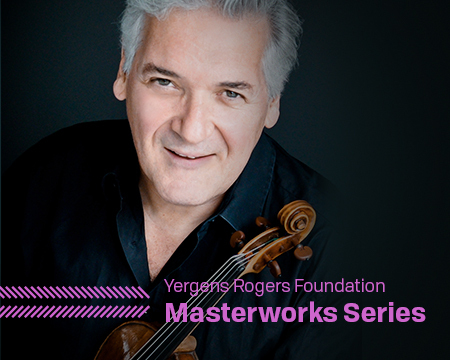 Beethoven’s singular masterpiece will be performed by one of the violin world’s most spellbinding artists. Andrew Constantine closes the season with Shostakovich’s best-known symphony, a work whose sublime third movement caused members of the audience to weep at its premiere. What’s better than a grand piano? Two grand pianos! The internationally celebrated husband and wife team perform works by Mozart and the Russian master Schnittke.